If you went to the 2018 Ft. Lauderdale boat show and walked past the Cheoy Lee display, you probably did a double-take, just as I did. 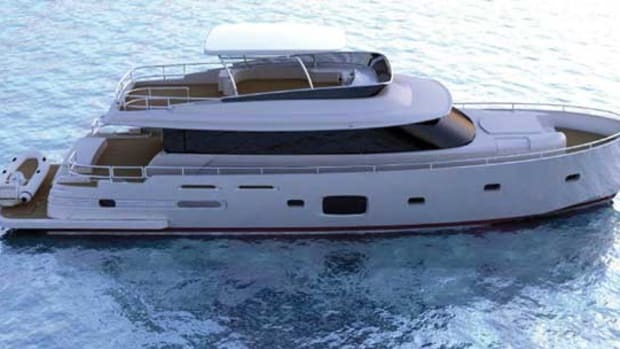 The Hong Kong-based shipyard recently rebranded its production yacht line as “CL Yachts,” with an eye-catching orange logo. But there is far more to Cheoy Lee’s new direction than just a logo change and abbreviated moniker. 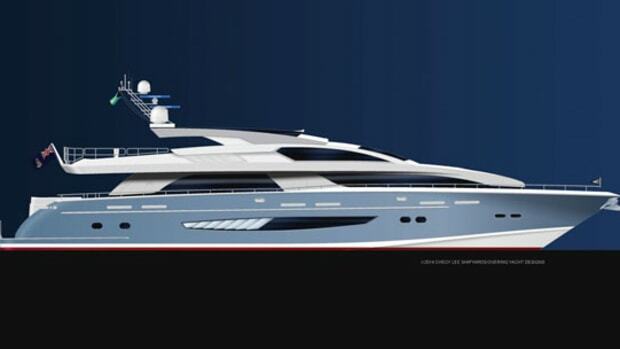 The shipyard also went to the design board and thoroughly updated two of its models. The larger of these is the CLA76. 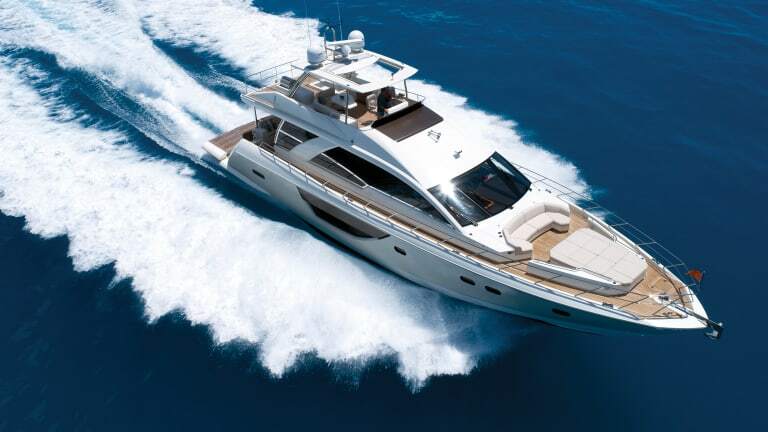 The “A” in CLA76 refers to “Alpha,” the former label for Cheoy Lee’s performance-oriented motoryacht series. 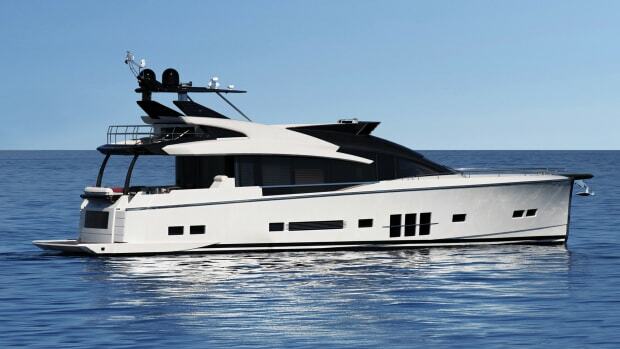 While CL Yachts has not altered the hull designed by Michael Peters, it has made other significant changes to the yacht. Notably, the entire house and flybridge have been elongated forward in order to create more interior volume and living space. The look and layout of the main-deck salon and galley are completely different. 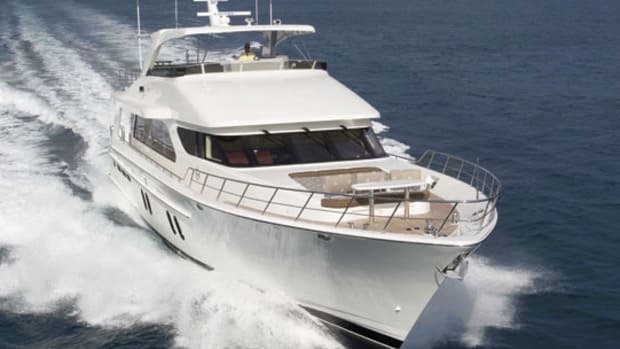 The deck is much more open, with clear, uninterrupted sightlines from the lower helm to the aft deck doors. The contemporary furniture is modular, which allows more flexibility for those who like to change things up. In the salon area, twin sofas face one another, framed by huge windows on either side. The dining table amidships is on the same level. 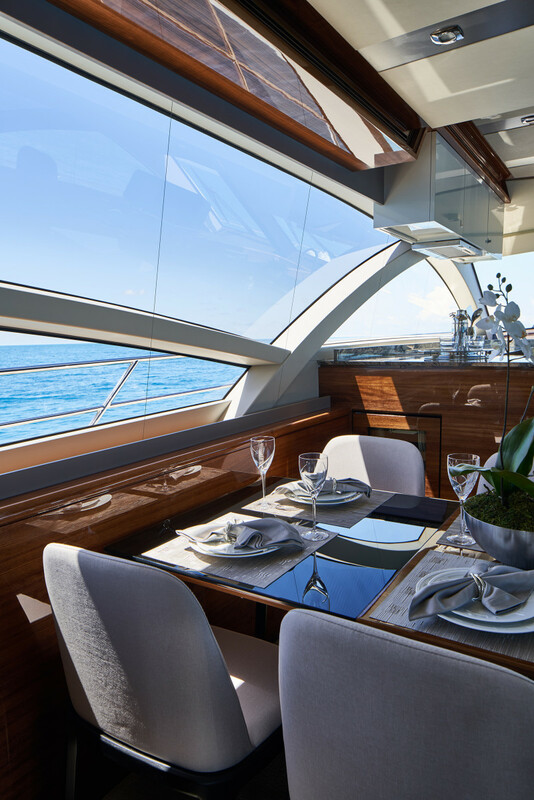 The galley, located one step up inside the windshield, has all its appliances tucked under the counter so as not to impede the view. A short flight of steps leads from the galley to the lower deck, which encompasses four en suite staterooms—a bonus on a yacht of this size. The forward VIP is generous, with a queen-sized berth. 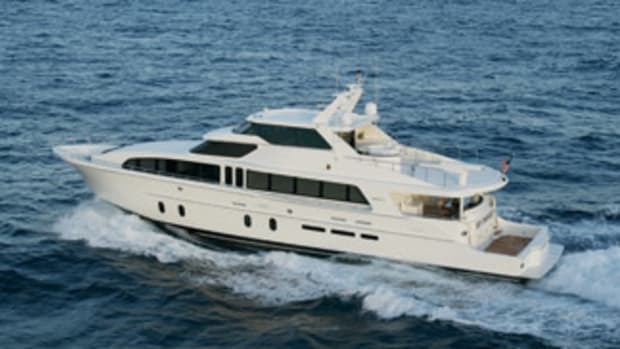 Aft are two mirror-image twin staterooms. 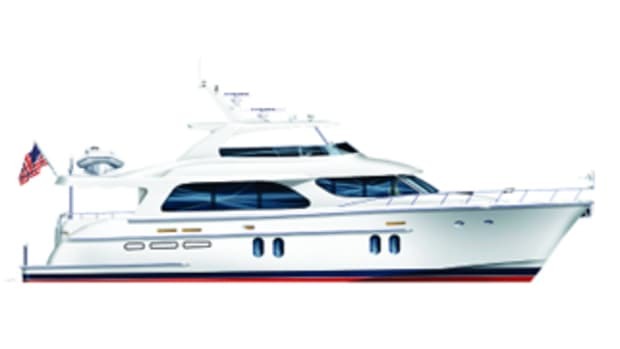 One has an en suite head, while the other head also can be entered from the companionway. Amidships, down another three steps, is the full-beam master stateroom. Here, the berth is athwartships, which makes the cabin appear even bigger. The en suite head with double sink, toilet and shower, lies aft, creating a sound barrier between the master and the engines. Aft of the well-laid-out engine room (the huge service area and fanatical attention to detail leaves no doubt you are on a Cheoy Lee) are crew’s quarters for one. While an experienced owner undoubtedly could operate the CLA76 themselves, having a berth and head for a captain or mate adds resale value. 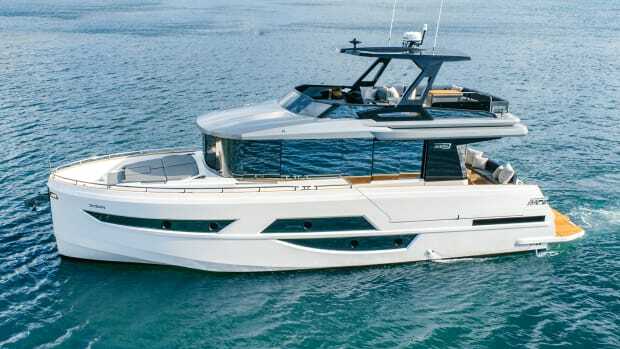 The flybridge features a full upper helm with an updated electronics array. There are two helm chairs, so the driver can have company, and a large retractable sunroof in the hardtop overhead. The rest of the deck is dedicated to lounging and entertaining, since the tender is stored on the swim platform below (a high-low platform is a popular option). Thanks to the flybridge expansion, there is now room for the must-have barbecue grill along with a separate cabinet housing a sink, fridge and freezer. The cabinetry also offers excellent stowage space. 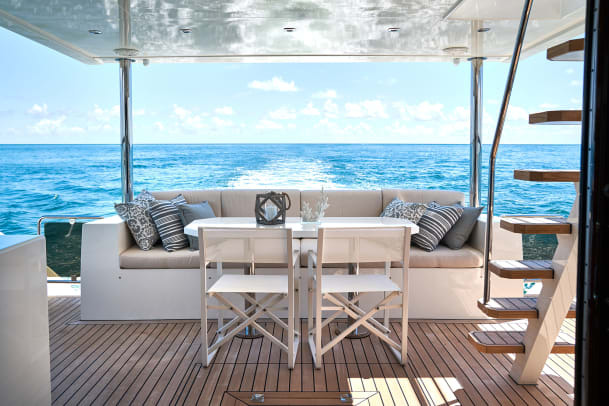 Spacious outdoor living continues on the main deck, which has a huge foredeck lounge/sunpad area, and the comfortable aft deck with long settee and dining table. 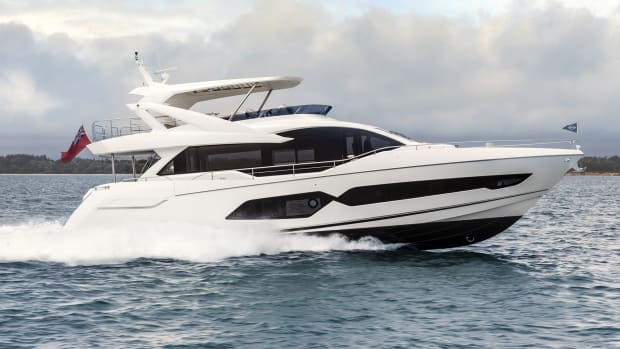 As the “A” in CLA76 reminds us, this boat is designed for performance. 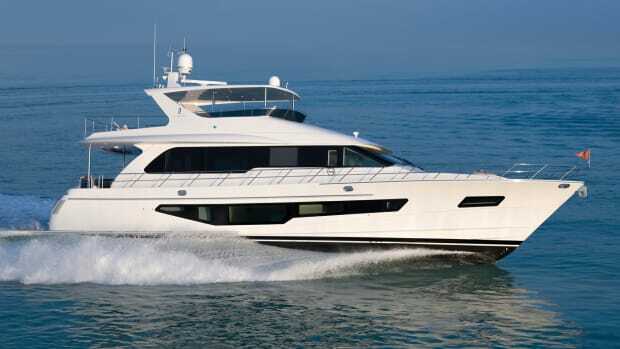 Its hull lay-up utilizes resin-infused composites, including carbon fiber, for reduced weight while maintaining hull strength. (The stone countertops are shaved to 5 millimeters and backed with foam, and the wood veneer panels have honeycombed backing.) 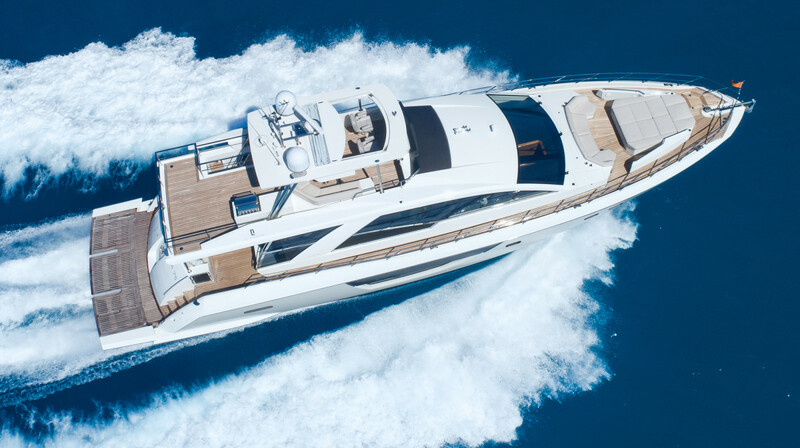 All this adds up to performance: With the standard CAT C18 ACERT engines, the CLA76 cruises at 22 knots and tops out at 29 knots.